Ever wondered how aluminum rims are made? No? Too bad! 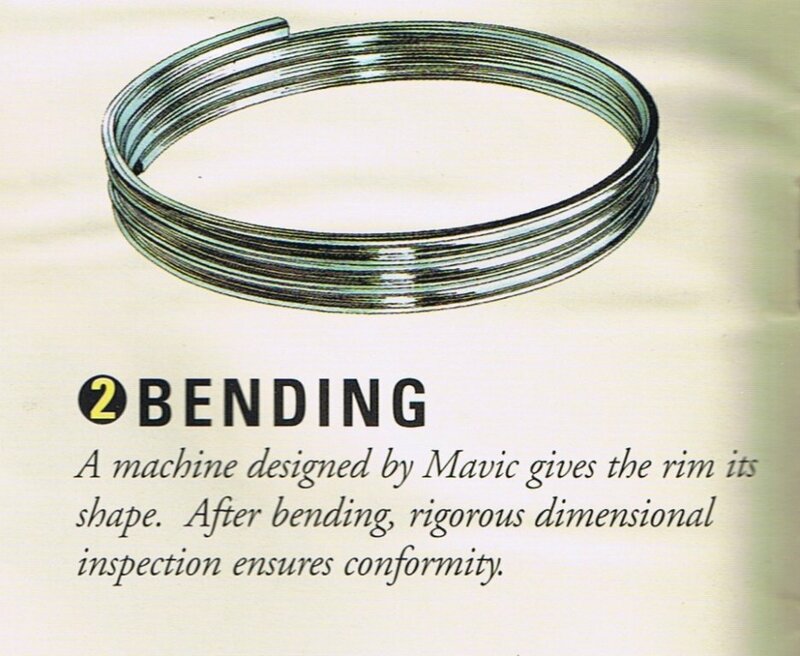 Here's how it happens, with diagrams from the 1996 Mavic Rim catalog. Step 1! 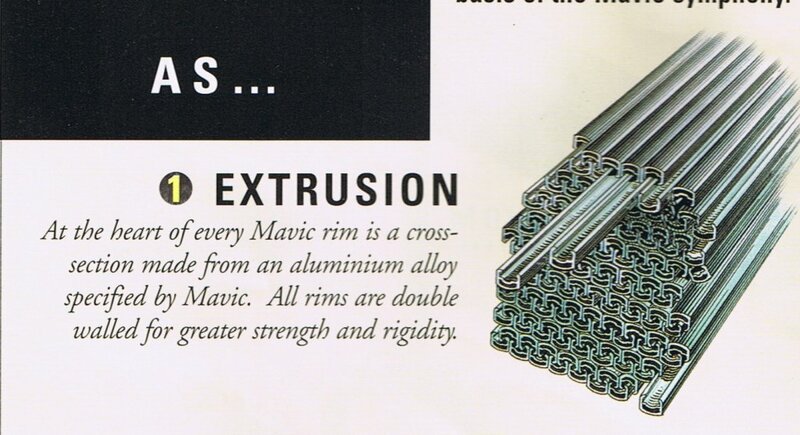 Procure aluminum extrusion based on your rim profile. These come as straight sections, extruded via a die in to the desired shape. Step 2! Coil the extrusions in to a continuous, spring-shaped loop of the right size. A straight line is then cut across the coil. Step 3! Join the two ends together, forming a hoop. Some rims have an aluminum or plastic insert here to hold the shape. At this point, some rims are also welded. Step 4! Drilling the rim. This is done using a re-targetable, computer controlled drilling system. Here's the drilling system Mavic was employing in the 1996 time frame. I doubt much, if anything, has changed. Step 5! Anodize. At least, this is where you anodize if the rim is. This is where another manufacturer's rim is painting or powdercoated. Machining of a brake track is probably also done here. Step 6! Eyeletting! Again, if your rim has eyelets. No eyelets, no eyletting. At this point, any finishing touches are applied, like decals, inspection is performed (hopefully) and the rim is wrapped and ready to head out. Carbon rims are obviously an entirely different process. I have some memory of a video that documented how they were made. Anyone have a link? check out Easton, the carbon wheels they make are extravagant, they have videos.